Counsel for a Boulder City resident charged by the city for interfering in a police-sanctioned crosswalk enforcement event has filed a motion to dismiss one of the charges on First Amendment grounds. Youtube Video The initial dash cam video given to the John Hunt's defense attorney includes red print and identifies the feed as Unit 277. Boulder City Police Sgt. John Glenn arrested Hunt on June 8, 2016, on several charges after he repeatedly walked back and forth in a marked crosswalk to protest a police-sanctioned pedestrian enforcement detail. Those charges included obstructing traffic and resisting arrest. The city originally dropped the charges against Hunt in late June 2016 but refiled them June 5, 2017. The motion also includes Hunt’s statement about the event in which he said he was not happy with his government’s actions and decided to exercise his First Amendment right to protest by legally crossing the street in a manner that gave proper notice to drivers. Additionally, Hunt said only one car was making an attempt to pass him while he was in the crosswalk, and he paused to let the vehicle by. 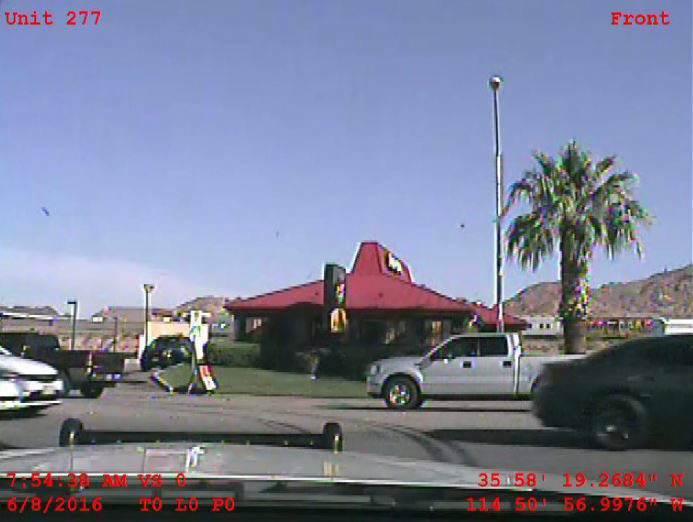 The motion also includes depositions from two Nevada Highway Patrol officers. Nevada Highway Patrol Trooper Marcia Pitchford said Hunt was in the crosswalk legally and thought Hunt was one of the operation’s decoys. She also said she pulled over a motorist that did not legally yield to him in the crosswalk. Currently, a hearing to address this motion is scheduled for 3:30 p.m. Tuesday, Feb. 27, in Boulder City Municipal Court.